Sandhya Aarti is the evening darshana. 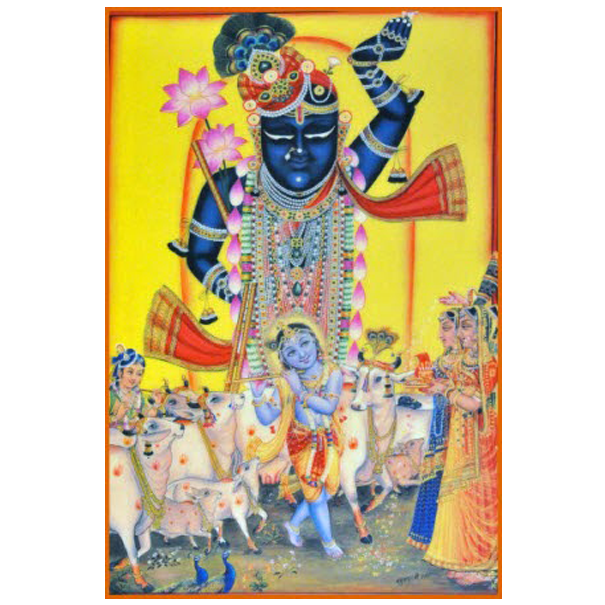 This darshana takes place at dusk, when krishna use to bring his Cows home from the fields. The predominant mood is matrubhava (motherly love). The fear of any ill effects resulting from his wonderings in the woods and protects from harm. After the day’s exertions, his garments now are light. He is offered his flute so that he can enchant his devotees and his Cowherd friends. To signal end of the day, sudarshana chakra on the roof of the haveli is offered consecrated food, and the seven Dhvajas (flags) are wrapped round their sticks until the next day. Chhitaswami is considered the chief musician for this darshana.